As we finish off Week 4 of the Innovators Program, I had the pleasure of chatting with Tim from CivicRise, one of this year’s Raleigh participants. 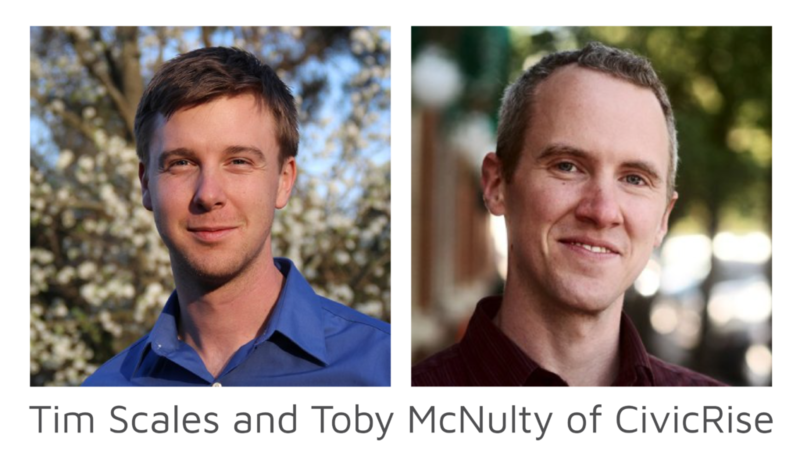 Tim Scales and Toby McNulty are working on a solution that will make civic engagement easier and more effective for advocacy organizers, their supporters and the public at large. Recently, Tim was feeling like he wanted to be more involved civically. He couldn’t find a trusted resource that gave him good guidelines for what to do and when to do it especially since timing is so crucial for making impactful change. The recent election and current political landscape got him thinking that he really wanted to move from sharing articles on Facebook to taking action that is meaningful and effective in the real world and feel like a part of the movement. “Uh Yes? Of course?”, Tim responded. ir cause – like “we need 100 people to call this senator about this bill!” , or “we need volunteers for this event!”, or “send an email regarding this issue you’re passionate about!” You can share your engagement, track the progress of the organizations you support, and provide assistance that is effective and rewarding. For the advocacy organizing groups and their customers, CivicRise is much more – it allows them to design, launch and measure efficacy of each supporter and overall campaigns like never before, enabling them to continually improve and learn from each campaign. CivicRise is a for-profit company with a SaaS business model with a large opportunity for growth, currently serving seven trial customers and 350+ users. Check out my interview below with Tim to learn more about CivicRise, the process of entrepreneurship, and how to get in some extra cardio on phone calls! Visit their website to learn more! Tim: I am very passionate about this idea and excited to work on it, but I am new to entrepreneurship and lack some of the structure around how to build a company. If I tried to do this on my own, I would just be making all the mistakes. The Innovators Program provides structure and expert guidance, and can greatly accelerate what we’re working on to build something exciting. T: So if you’re working along and you run into a problem, instead of going to Google and trying to just figure it out, I can have a conversation with someone who is way smarter than me on these things, someone who has worked extensively in these areas. They can just point me in the right direction, and this saves me so much time and effort and vastly increases our chances of success. M: Thank goodness for tech-y cofounders! What was the “ah-ha” moment that led to starting your company? Short answer, the 2016 election. M: Same. What problem are you trying to solve? I’m currently training for a triathlon, so lots of swimming and biking and running and jumping. M: I’m tired just hearing about it! Any big takeaways from the first few weeks of the Innovators Program? T: What has been most useful to me is providing some structure around how to talk to customers about CivicRise. I’ve stopped taking random notes on sheets of paper that I lose – instead I’m creating a more scientific process with the help of the Innovators Program to really understand the customer’s need and address it more directly in a way that is going to build a foundation for growth moving forward. I went from doing interview that were like, “Here’s this cool thing! Don’t you think it’s cool too?” And everyone would say, “Yes!” And I would think, “This is amazing!” But now, I ask hard, real questions where people can disagree, which is so much more valuable. Yes, it’s way harder and feels more awkward, but it’s a much better investment of time. M: Totally helps you get to a more effective product. So how do you stay energized for the long workdays of entrepreneurship? Fun rituals? T: I try to switch off 100% when I’m not working and spend quality time with my wife and friends and family so when I get back to work, I feel refreshed and ready to take on a new challenge. I also like to do jumping jacks while I’m on the phone sometimes. If I feel like someone is going to talk a while, that’s when I fit my jumping jacks in. It makes me sound really excited and energized. If you’re interested in getting your cause on the CivicRise platform or want to become more involved in your community using the app, sign up here! Thanks Tim for sharing your thoughts and progress with us, looking forward to using CivicRise in the future and seeing you at the next march! Check back soon for more interviews with this year’s participants!